The act of showing a prototype car at a car show with the intent of taking money for reservations can have two possible outcomes, with two possible motives: First, everything could go great, and people would get their cars. This is rare. The other way is that everything goes to hell and nobody gets their car, and everyone loses their deposit. Nobody’s happy. This outcome can be caused by either simple failure or a premeditated grift. In the case of the Dolo, no one is really sure what happened: failure or scam? The Dolo JB-10 is a fascinating car, mostly because of its strikingly awkward look and its murky story. In 1947, three men, known only as Messrs Brun, Dolo and Galtier formed a company called BDG in Pierrefitte-sur-Seine, France. The trio managed to produce a car, called the Dolo JB-10, and show it both at the 1947 Salon de Paris and then later, in October 1947 at the Paris Motor Show. A year later, the Dolo showed up at shows in Brussels and Geneva. The Dolo was mechanically quite advanced for the era: it was a front-wheel drive two-seater, with a 592cc flat-four making around 23 horsepower, driving the wheels through a four-speed gearbox. There was also a larger car, the Dolo JB-20, mentioned, a full four-seater with engine specs that suggested two of the JB-10 engines would be combined, somehow: a 1184cc flat-eight making about 44 hp from those eight tiny, tiny cylinders. The Dolo’s styling was quite futuristic, but also deeply strange and almost alien. 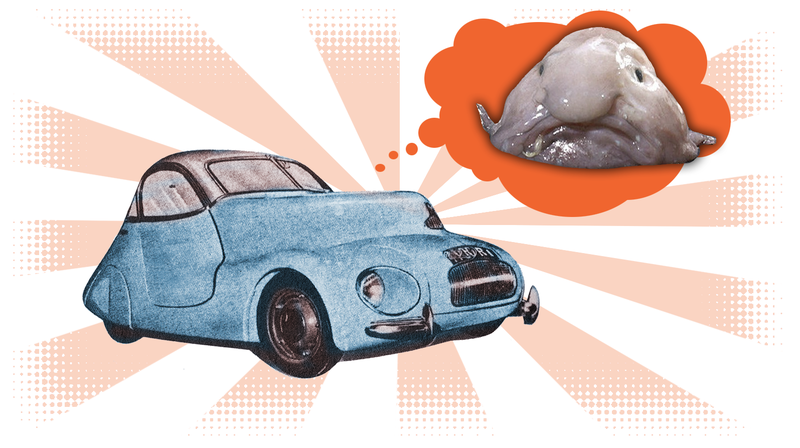 It had a certain resemblance to a blobfish, with lumps upon lumps and a large plexiglass dome forming the greenhouse. The rear had skirted wheels and a dramatically raked profile, in contrast to the highly bulbous front end. The thing was downright unsettling-looking. Like you’d open your garage and see it and go ‘gaaah’ and drop your drink. Every morning. The JB-10 that was exhibited publicly was never shown with its hood open, and it’s not clear if it was ever witnessed running or not. Despite this, BDG did manage to take some reservations for the car, and some sources say BDG even offered financing, a rarity at that time. Soon after, though, Brun, Dolo, and Galtier were gone, along with everyone’s deposit money. It’s said that around 200 orders had been placed for cars between the four shows where the Dolo was exhibited. This seems like a pretty clear example of a hoax, but there’s no real consensus if the original intent was to scam people, or if the company just found themselves unable to achieve what they set out to do. Years later, the original Dolo car from the motor shows was allegedly found by Jacques Potherat, and it was revealed that it was just a model, with no actual mechanicals. You’d think that’d be enough evidence to suggest this was all a hoax, but, even among the tiny community of people who even know or care about the Dolo, there’s no consensus. I think one thing we can all agree on, at least, is that the Dolo is really, fascinatingly ugly.